Creative Computing for the Rock Stars! We know it surprises some people when we put creativity and coding in the same sentence. It just doesn’t compute (pun intended!). You probably just see coding as computational, mathematical and, sometimes, boring. But we’re here to prove you folks wrong! Software, apps or websites – basically almost anything and everything can be programmed with code these days! But even the creative industries – from fashion, to music, and art – are increasingly looking to programming as a means of pushing the boundaries of their own creative expression. So what’s creative computing all about? Creative computing is a type of computer programming in which the goal is to create something expressive instead of something functional. We want our kids to be able to live in this increasingly digitised world but we also want them to be able to express themselves creatively. Code your own Air Guitar! Enter the Kano computer, the pixel kit & the motion sensor. We take you behind the scenes below with Huda & Rama, our curriculum developers (or Rocket Launchers as we call them) – as they share their thought process as they designed the curriculum for one of our most exciting new courses launching this June, Become A Rock Star Code DJ. Rama: We were looking at what was possible with these tools and the constant theme that was resonating with us was the idea of creative computing. The idea behind creative computing is to use technology as the tool to do something creative, instead of it purely being writing code for something functional like a software programme or a website. We want to use technology & code to do something creative. Huda: I feel that people tend to separate coding & art. When you think of learning to code you don’t immediately see art as part of it. I’ve had kids in class tell me that they don’t really enjoy coding and they want to do more drawing or craftwork. I’ve also had kids tell me the opposite – they love coding but don’t really want to do anything else. The Kano is a great way of bridging this gap. Kids get to do a bit of both and explore new things that they didn’t think they would enjoy. Rama: We want kids to realise that you can use code to do anything, to create anything you want! Huda: Plus, coding isn’t just screen-based. It’s not about just making games or animations either. 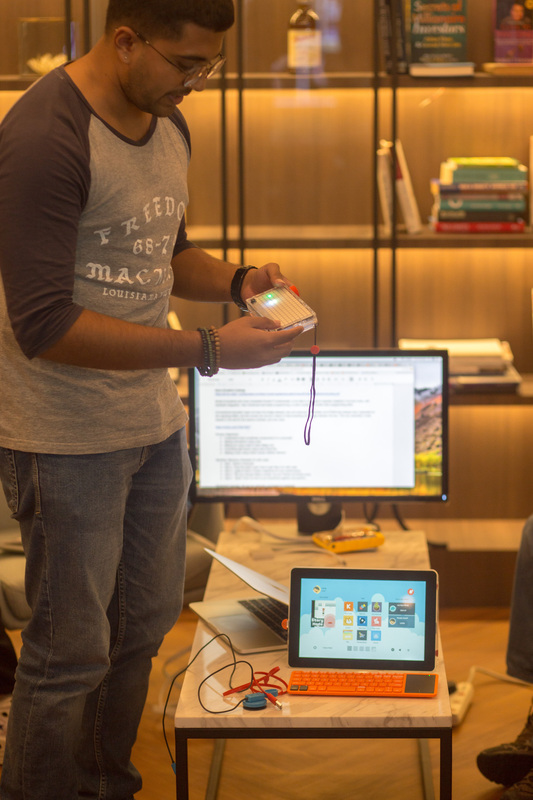 In a way the Kano is one-step ahead of Scratch – while it’s still block-based programming, you can do a lot more things with it from a creative perspective. Yes, you can make games and animations, but there’s also the potential to go one step further and code music and visualisations. Code your own Pong game! Rama: In that sense, it’s another way for kids to build creative confidence while still learning technical programming concepts. The world is moving towards one where you need a mix of technical skill & creativity – in every field, not just the arts. What we want is for kids (and parents!) to walk away with the understanding that programming isn’t just for software engineers, app developers…Even if you’re a musician (or by extension, any profession), code can help you to see the world in a different light: A world that can be programmed and a world of code where you can express yourself. Coding isn’t just about apps, websites, or ones and zeros. It doesn’t even have to be entirely screen-based. Build your own computer, get creative by coding your own music or foray into the world of digital art. The possibilities are limitless, the journey is endless. 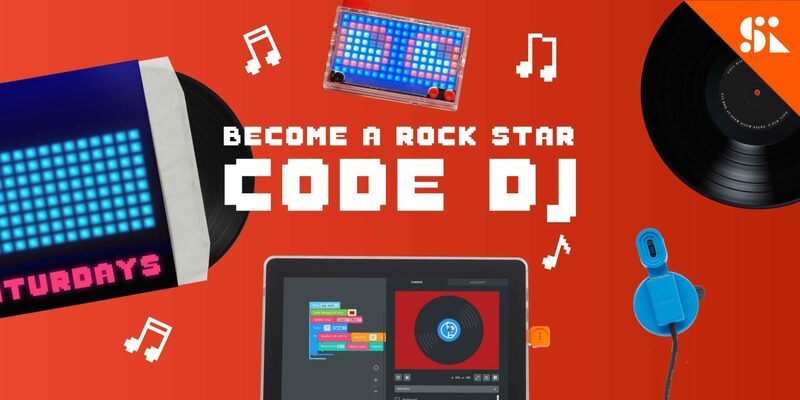 Be one of the first to experience our new course “Become A Rock Star CODE DJ” this summer. Save $60 if you register by April 22. Full schedule available here.